Wouldn’t it be comforting to have a friend who knew what you were going through with chronic pain? Wouldn’t it be encouraging to have a support whom you found inspirational? 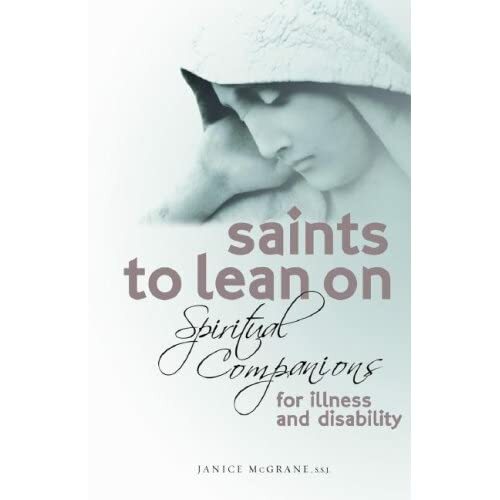 Sister Janice McGrane shares with us these resources in her book Saints To Lean On: Spiritual Companions for Illness and Disability. I recently interviewed her about her own experience with the challenges and positives (yes, positives!) of living with chronic pain. In her book, she describes 11 saints who have lived with disability and illness. She presents both what we can learn from their lives and how they responded to illness, as well as invites us to call upon them to support and assist us. Do you have to be Catholic to find this book wonderful? No. Do you have to be nearing sainthood yourself to find this book helpful? Absolutely not. Saints are unforgettable people who lived their lives with a close connection to God. But, as described in Saints To Lean On, they are also clearly human beings with weaknesses and doubts. I found the 11 stories inspiring and full of helpful insights. I liked the book so much that I’ve already bought 2 other copies to give to friends with physical challenges. Sister Janice McGrane’s book is a true gift to people who are challenged by illness.